A few weeks ago I shared the new habits and tips I have incorporated into my life to help me simplify making dinner. Spending time in the kitchen has also caused me to eat in a new way. I have been inspired by food! I want to share some of the new beliefs, recipes, and food that have me and my family so excited. Eating less: In general I’m eating less. Although I still eat three meals and two snacks, I eat smaller portions. Sometimes I have whole food smoothies for breakfast instead of a meal. I am still working on not wasting food in our home by buying only what we need. I take after my mother in that I tend to buy at least two to three times more food than we actually eat, especially when I entertain, but I’m trying to be more aware when I shop. Simple meals: I am keeping meals simple and blurring the lines of breakfast food versus dinner food. Kale salad can work for breakfast, oatmeal for lunch, etc. I also like to have dinners that are made up of small plates or snacks such as salad, soup and hummus with crudités. Gluten- and dairy-free: About a year and a half ago some tests revealed I had an intolerance to gluten and dairy. I ate a ton of gluten and dairy! I decided to go cold turkey for a month and see how I felt and I within five days I felt better than I had in a long time. It really was a dramatic difference—I felt energized, happy and had a clarity of thought I had not felt in awhile. I find if I bring too much gluten or dairy back into my diet, I start to feel low on energy and depressed. Fortunately, there are plenty of gluten free products available, and diary substitutes—like almond milk. Raw food: There is no doubt that philosophically and aesthetically a raw or mostly raw diet inspires me. I am moved by the beauty and colors of raw fruits and vegetables. I love the idea of the simplicity of raw food and a raw food kitchen. Physically I don’t think anyone can argue with the benefits of more raw vegetables, but I still rely on some animal protein and cooked foods and grains in general to feel good. Farmers’ Market: A few years ago I got hooked on Farmers’ Markets. This was the beginning of my really focusing on my family’s meals. Farmers’ Markets are beautiful and bring you that much closer to your food’s source. I found that all my fruits and vegetables tasted so much better and also stayed fresh twice as long as those from the grocery store. And I was reminded of what a real strawberry tastes like! If you don’t have farmers’ markets nearby, or if they are seasonal, check out local harvest.org. Cruelty-free: I am working my way towards being a vegetarian for philosophical reasons more than health reasons. It seems I feel better physically with a bit of animal protein, but particularly given how animals are treated, it does not seem ethical. Clearly being a vegetarian is also a greener, more sustainable choice. Balance: I find that extremes don’t work. There are so many different opinions out there about what to eat I think it can make you crazy. The latest healthy diet may just turn out to cause health problems down the road. I feel like the safest path is to take, is a bit of each philosophy. I feel much healthier when I am primarily gluten- and dairy-free and I don’t think anyone can argue that eating more greens and vegetables isn’t a good thing—but I still will eat dairy and gluten at least once a week and sometimes more. Eating from a place of Oneness rather than separation: I once met a guru who drank coca cola. Because he has the ability to bless things and make them whole, he went for taste. Similarly, I remember Reverend Michael Beckwith telling a story of how he typically ate a very clean diet, but on the occasion he did have dessert or pizza and he would bless the food and affirm “to health and toned muscle”. I really believe that it is not always what you eat that affects your health or how your body responds to the food, but what you think about what you eat. Consciousness overrides. If we think it is unhealthy for us chances are it will be. When I first started learning about healthy homes I started feeling like everything in my house was making me sick. I had to pull back and reclaim my own power to heal and be well despite external influences. I caught myself doing the same thing with food and I became increasingly sensitive to not just gluten and dairy, but so many other foods as well. I started to have a fear relationship with food. This does not give license to just eat junk—what I find is that when I tune into my body and listen I am naturally drawn to certain foods. But I am coming from a place of oneness that all food has the same source- whether French-fries or kale. When I make “healthy” choices, it is because it feels right—it is a reflection of who I am and my values—not because of separation and fear. More than what I eat, this consciousness seems to make all the difference in whether my food makes me feel vibrant and energetic or blah. 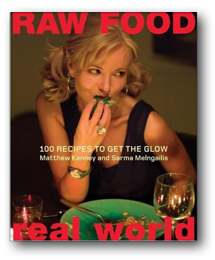 The book Raw Food Real World introduced me to to raw foods and really inspired me. I consider my friend Dane Findley a green smoothie guru. I still love the fantasy and fun of candy and treats, so I am always excited to find more healthful versions. I really like this Italian Cream Soda recipe. And if you like sweets as well, you can read about where to find dye-free candy here. I had a very green lunch the other day inspired by Pamela Salzman’s “Citrus Kale Salad” recipe and a Kale-Pineapple-Chia Smoothie from the book Clean. When I was visiting Los Angeles recently I had breakfast at Kreation Café and enjoyed the oatmeal with blueberries, flax and acai. I love how they serve their whole food smoothies in mason jars.